About the User: this project was commissioned by a client that provides IT and infrastructure services and equipment to other businesses and also many government bodies. Project Brief: in an expanding business, the client firstly implemented QuoteWerks to improve quote production efficiency. They then, to improve the efficiency of getting accurate prices for shipping the equipment and due to our proven track record of developing FedEx integration, engaged ConnectIt Software to build an integration for UPS. A custom QuoteWerks Tools menu option which opens a screen to allow the User to get prices for one (or all) of the packages that make up the overall project consignment. Easy entry of package details alongside the standard Line Items that are created as part of quote production. The ability to easily compare prices for different services from a Carrier and also compare prices between Carriers. Semi-automated templated emails to notify customers that equipment has been dispatched. Automated templated emails to update customers and internal staff with details from the Carrier regarding progress of items through their systems. Semi-automated retrieval of consignment Tracking References and Statuses (and potentially other useful information) onto the QuoteWerks Document. Various configuration options to set up details of the QuoteWerks database, FedEx and UPS accounts, email templates, etc. Accurate prices for shipping reducing the likelihood of underselling this aspect of a quotation and cutting in to the gross profit. Easy comparison of prices to get the end customer the most appropriate service at the best price. All information is stored in the QuoteWerks database for future reference. 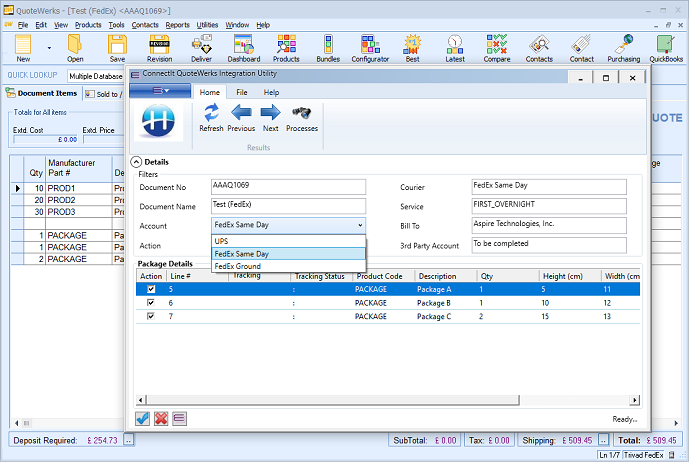 Inclusion of the ConnectIt QuoteWerks Email add-on means that automated emails can be set up for other customer, supplier and/or internal email requirements, such as reminders for suppliers to confirm delivery details or distribution of KPI (Key Performance Indicator) information to internal managers. Users work seamlessly between QuoteWerks and the integration utility. A highly intuitive User-interface means minimal training required. Highly flexible and expansive configuration options so that modifications may be made without the need to redevelop the solution. 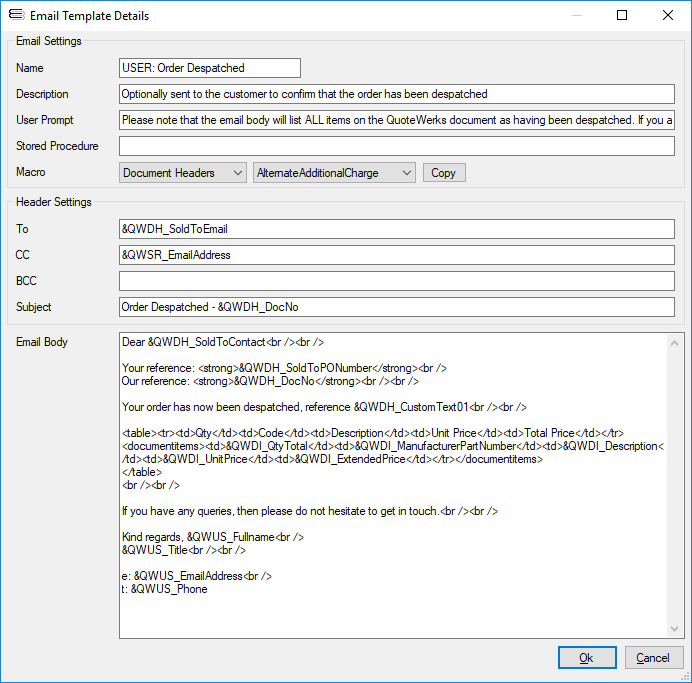 The option to configure multiple FedEx & UPS accounts. No need for QuoteWerks Real-Time module licenses. Illustrates a breakdown of how the Shipping Rate is calculated (fuel, surcharges, etc.) which are also written into the QuoteWerks Document for reference. Includes validation as to what Document Type and Status combinations may have the Shipping Rate updated. Size and weight package information is taken from the Product itself or written into the QuoteWerks Document and so no need to re-key information. Retrieves pricing for multiple packages with different sizes and weights in one single request to optimise costs. Retrieves Tracking References and Statuses into the QuoteWerks Document which can then easily be added into Document Layouts and sent to your customer. The option for 3D Bin Packing optimisation (see here.